It wasn't long ago that things looked bleak for Thandi. In 2012, she and two other rhinos were brutally attacked and left for dead by poachers who used machetes to rob them of their cherished horns. Incredibly, despite the odds stacked against her survival, Thandi managed to pull through. And now, three years later, she's delivered another miracle. 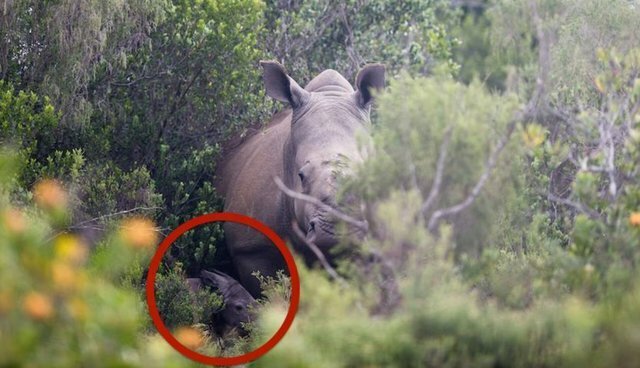 Kariega Game Reserve in South Africa announced this week that the survivor rhino Thandi had been spotted in the company of a newborn calf tucked safely by her side. Veterinarian William Fowlds, whose tireless work was instrumental in helping the rhino heal from her wounds, says that both mom and baby appear to be in good health. "I am sure that the whole rhino caring community will share in the joy of this amazing birth," says Fowlds, in a statement released by the game reserve. "Thandi's story has always been an incredible testimony of the will to survive against all odds. She represents so much of what her species faces under the current poaching crisis. Her survival has already given us inspiration but the birth of her calf brings a new dimension of hope to the crisis showing us that a future generation of life is possible if we put our minds and hearts to it." Thandi, knowing full well of the dangers that loom for rhinos, reportedly led her new offspring deep into a cordoned off area of the sprawling reserve. Staff there aren't taking any chances either; since the attack that nearly claimed Thandi's life, they've beefed up security with a rhino protection unit to guard the animals around the clock. 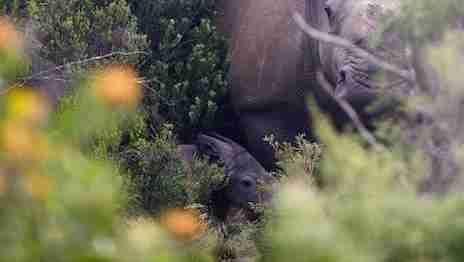 The birth of a new arrival couldn't come at a more important time considering the dramatic drop in rhino numbers in recent years. In 2014, a record 1,155 rhinos were killed at the hands of poachers - a whopping 4.6 percent of the estimated 25,000 rhinos left in existence in Africa. While conservationists are working tirelessly to curb the decline, it's heartening to know that survivors, like Thandi, are doing their part to reverse it.